In recent years, the DIA Group has been implementing a digital transformation process involving all levels of the organisation, with a twofold objective: to improve the company’s operating efficiency and to leverage one of the company’s most valuable assets: the extensive knowledge of its customers, offering solutions that are adapted to consumers’ new shopping habits. With this outlook in mind, the company focused on the following projects in 2017. During 2017, the company worked on improving its value proposition in online sales in Spain, with an increase in the number of delivery times (even on the same day as the order is placed), as well as the rollout of a new application that allows customers to shop from their mobiles in Spain, the activation of customer applications in the markets of Argentina and Brazil where it was not yet present, as well as the digitalisation of commercial services to streamline the processes, reducing the number of administrative tasks. The omni-channel concept developed by the company in recent years has placed it in an unbeatable position in the online shopping segment. 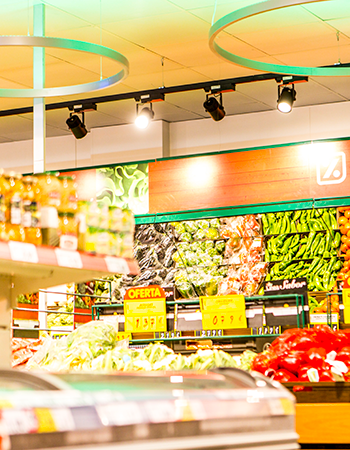 The DIA Group is at the forefront of the digitalisation of services in the retail distribution sector thanks to increasingly digitalised in-store services, the online sale of non-food products, and synergies between the extensive network of physical stores and the online channel. DIA Spain has reached an agreement with Amazon, the online sales giant, whereby its Prime Now customers can order more than 5,300 SKUs (fresh and packaged foods) from DIA’s supermarkets and receive them at home in under an hour. This service, which began in Madrid in 2016, is also available in Barcelona and Valencia, and will shortly be rolled out in other cities across Spain. The agreement with Amazon was also broadened during 2017 with the installation of delivery lockers at 13 La Plaza de DIA stores for purchases made on the Amazon website. The orders are placed in secure delivery lockers, which can be opened by entering a code or scanning a barcode. The delivery lockers are automatic and are located at the entrance of the La Plaza de DIA stores. The collection timetable is from 9am to 9pm. As of last year, the DIA Group has been developing an ambitious project that implies re-engineering and digitalising its main commercial processes. This project has led to benefits such as the optimisation and standardisation of processes, the complete digitalisation of information as well as its traceability, and a reduction in time to market thanks to a better execution of the processes. The solution chosen for the digitalisation of the processes is the AuraPortal tool, a software package by BPM (Business Process Management), one of the leaders in the sector, which allows processes to be modelled, implemented, and operated. Thanks to this implementation, in 2017 the DIA Group won an international award from the Workflow Management Coalition (WfMC), which values the DIA Group’s ability to successfully develop an innovative, wide-scale project. The Workflow Management Coalition awards are given to organisations that have stood out by implementing innovative solutions in their business processes with the aim of achieving their strategic commercial objectives. In parallel with these projects, DIA is also working on a project to digitalise the POS (point of sale) systems at its stores in Spain. This is a new IT system that allows the company to centralise its back-office functions that are necessary to manage the stores (stock control, orders, etc.). In order to implement this project, the company has had to integrate a new architecture into its centralised systems, acting as a platform from which to process all the information, not only in a centralised way, but in real time. Access from the point of sale is carried out through a new graphical user interface that has been developed based on criteria of productivity and ease of use by store staff. The new architecture, centralisation of functions, real-time management, and graphical user interface have allowed the DIA Group to digitalise a large number of processes, eliminating the use of paper and making the processes much more efficient. During 2017, this system was implemented in more than 110 own stores and franchises, which are acting as testing grounds ahead of the rollout to the entire store network planned for 2018. In parallel, the company is developing the content necessary for the rollout to the other countries in which it operates. 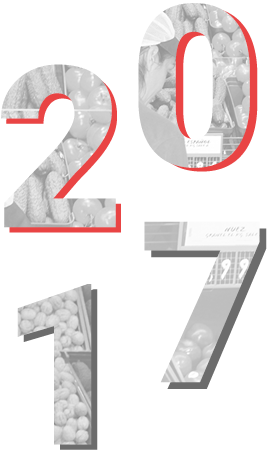 As part of the DIA Group’s ongoing “Listening to the customer” programme, during 2017 the company started a transversal project (which applies to all the countries in which it operates) focused on managing and improving the stock levels of specific products in stores, which is one of the main customer requests identified by DIA. Improve the setting up of parameters related to automatic orders. This project has led to all of the store replenishment processes being reviewed, from orders and logistics to store management. This company aims to allow companies to sell more and generate less waste, by assigning fluctuating prices to products that allow consumers to choose how much they want to pay for a product in accordance with its expiration date. This company provides an efficient way of collaborating and sharing organisational knowledge on a broad scale, allowing companies to promote commitment, create capacity, and retain its best talent. This company is specialised in vegetarian cooking, using artificial intelligence to compare the ingredients that users have available in their kitchens and recommending the best way to combine them when following recipes. This company provides information on customers’ individual habits and preferences, allowing brand managers to develop effective and efficient marketing campaigns while measuring the results in real time. For more information on this initiative, please refer to the website especially set up for this programme (www.nexusbydia.com). Another priority for DIA is to ensure that all of its employees are trained in all aspects of digital transformation. With this in mind, in 2017 the company set up the Digital Transformation School, and to date more than 1,000 employees from the group’s headquarters have benefited from this initiative. The aim is to provide a space where digitalisation can be dealt with through cultural change in the company, while providing the necessary tools and concepts to implement this change. Therefore, this project aims to focus on previously identified training priorities, provide a network of leading trainers and the necessary training resources, and to then measure the successful shift from the analogue world to the digital world. Over the last year, the DIA Group has set up a transversal working group in which employees from all the countries in which the company operates are involved. This aim of this group is to develop, in-house, new digital applications focused on improving the experience of customers, franchisees, and employees. This has led to the implementation of several applications that have been rolled out in a simple and fast way across all the countries in which the company operates. Once developed and rolled out in the company’s own stores and franchises in Spain, this application makes tasks easier, simplifying access to information and streamlining customer service, given that it enables instant access to all the information related to questions that consumers might have (prices, stocks, offers, etc.). This application also manages returns, modifications, and products sent directly to stores, all via mobile phone. For now, this application is available for stores in Spain, where franchisees can also place orders directly through the mobile application, with no need to use the sales terminal. This application has been developed over the past year with the aim of streamlining the daily management tasks of employees and franchisees. This application provides a digital stock count of all the store’s SKUs and uploads the files through this simple and intuitive application. The almost minute-by-minute inventory updates provide a more reliable and accurate view of the stock’s financial situation, along with enhanced stock control and better knowledge of customers’ immediate needs. For a number of years already, customers in Spain have been able to use another free application developed for iOS and Android which allows purchases to be managed from any mobile device. It has already been downloaded more than a million times in Spain. 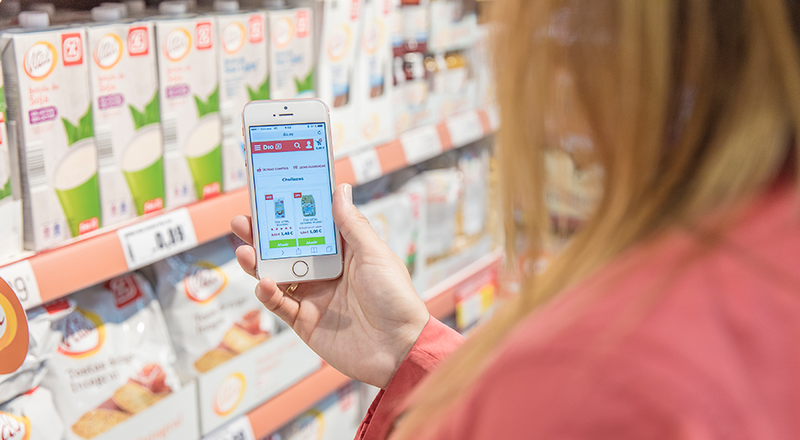 Among the many functions available on the app, users can create their own shopping list for their usual store, check on the location of other stores, link the loyalty card in order to obtain digital discount coupons, see the latest news about new store openings, access real-time information about their purchases and the related savings, and see a list of all promotions. During 2017, this application was rolled out in the Portuguese, Brazilian, and Argentinean markets. In line with the company’s objective to improve the online experience, during 2017 DIA launched a new exclusive mobile application that streamlines the buying process and adds new functions that help customers to simplify the procedure. This new application allows users to quickly add products to their virtual shopping baskets by means of a powerful search function. The main new developments related to the technology used in this application include the fact that customers can use the microphones on their mobile devices to add products to their shopping baskets using a voice-activated system (in addition to the traditional keyboard input option). 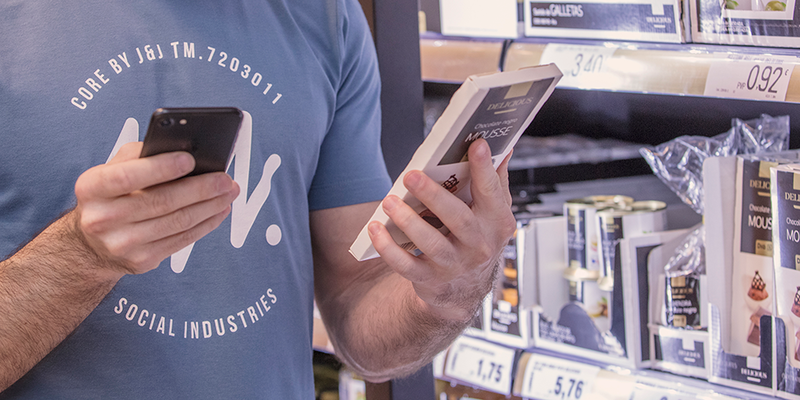 Furthermore, the system allows customers to scan product barcodes using the mobile device’s camera and add them to the virtual shopping basket. It also includes a new system that offers alternative options if a product is not available at that time in the product catalogue available at www.dia.es. This application also uses technology that allows users to recover old orders or saved lists to place a new order more quickly. During 2017, DIA launched a new application that helps franchisees with their daily management tasks. It allows franchisees to check all the information on marketing activities specifically aimed at them in addition to key information related to store margins, product lists, and purchase prices, among other things. This application was developed in Spain during 2017 and in the next few years it is due to be launched in the other countries in which the company has a presence. The DIA Group also has a mobile application aimed at improving the logistics services by offering real-time monitoring of deliveries by those in charge of logistics. This application allows daily monitoring of delivery frequency with the aim of rapidly adjusting the frequency and implementing improvements in order to guarantee that a store’s sales level is aligned with the reserve capacity. This application started to be developed during the past in Argentina and was then launched in Spain during 2017. In total, the activated amount corresponding to the capitalisation of IT development in Spain during 2017 is EUR11.2m, 57.7% more than the investment carried out in 2016 (EUR7.1m). Check prices, stocks, and offers.